Raina Telgemeier's Ghosts was among the most anticipated books in my class this year. Students would ask me constantly when it would be published. When it finally was, the students tracked who had it and who would get it next. I love a book that the class fully owns with nothing from me except the money it costs to buy it! Cat's family moves to Northern California because the air will help her younger sister's cystic fibrosis. Cat isn't excited about the move, and even less so when she realizes that the Day of the Dead and ghosts figure so prominently into community life. She rejects it repeatedly, until she realizes that maybe some time with ghosts is just what she needs. 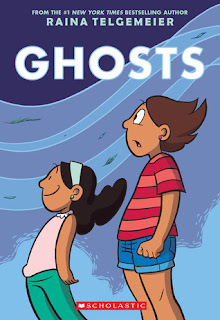 I love Telgemeier's books and artwork, but I really didn't connect with the protagonist here. Cat is so negative about everything that she comes across as a drag. I want to be on the main character's side, but I found myself liking everyone else better than her. There is controversy around this book which is worth considering, but I also know that no amount of controversy will stop kids from devouring everything Telgemeier publishes.